When I was a kid, COTH and Practical Horseman were the two big magazines for the h/j crowd. COTH was the fancy “cool” magazine with all the pretty show pictures and ads for things I could not afford. I went about a decade without picking one up (aside from the stallion issue, which I used to buy every year) but since winning a subscription at AEC and reading them regularly for the past year plus… it’s lost a lot of it’s luster for me. I like their Untacked side publication and I like the fact that you can choose print or digital, but the content has left me wanting. Practical Horseman is still the same ol’ solid, dependable magazine that it always was, with lots of riding articles, but it starts to feel like the same thing over and over after a while. Fun to page through, but nothing particularly exciting or cutting edge. This year I’ve branched out a little bit into some of the newer publications, wanting to find something different. After lots of looking and a little trial and error, I’m left with three: Heels Down, Horse & Style, and The Horse Magazine. Heels Down is a digital magazine that seems to be catered more toward the younger crowd. They’re usually one of the first to cover new trends or tackle more controversial subjects, plus they have a pretty good balance of riding articles and a really solid social media presence (not to mention their fair share of great giveaways). There is definitely a lot of variety. The magazine is downloadable each month via their app to your smart phone or tablet for $4.99 per issue, or $3.99 per issue if you have a subscription (there’s a one month free trial period so you can check it out first if you want). It’s fun, it’s cool, and it’s current… perfect for the 18-30 crowd (or, uh… 33yo’s who are pretending like they aren’t as old as they are. Ahem.). Horse & Style is, in a word, posh. It’s printed on sturdy paper with a thick cover, has TONS of show photos, and definitely gives an overall high end, elegant feel. They do rider interviews, style guides, articles about horse shows, equestrian vacation destinations, book reviews, Q&A with a sports psychologist, etc etc. It has a very grown-up, sophisticated feel to it… and it’s just ridiculously gorgeous, cover to cover. They too have a good social media presence, with lots of horse show photos and monthly giveaways (I won one!). You can also page through it here. Then there’s The Horse Magazine, an Australian publication that I’ve mentioned on here before (and now you can read it online here). They focus a lot on what’s going on in the show world internationally, plus have riding articles and a good dose of breeding stuff thrown in. My favorite thing about them is that they’re never afraid to be blunt, even if it’s controversial. It’s not all rainbows and butterflies, which is really refreshing. I love all three publications, for very different reasons. If you want something that feels young and fun, I think Heels Down is worth the download. If you want something decadent to hit your mailbox every other month that you can slowly and indulgently page through, Horse & Style certainly fits that criteria. If you want something honest that will get you thinking, The Horse is a great read. If you like variety, read all 3. I used to subscribe to Warmbloods Today, a US based breeding-centered magazine, but let my subscription lapse for some reason I can’t remember. I really should renew that, because it was a cool magazine if you’re into the breeding stuff… I’ve given a gift subscription to a few people for Christmas before, too. 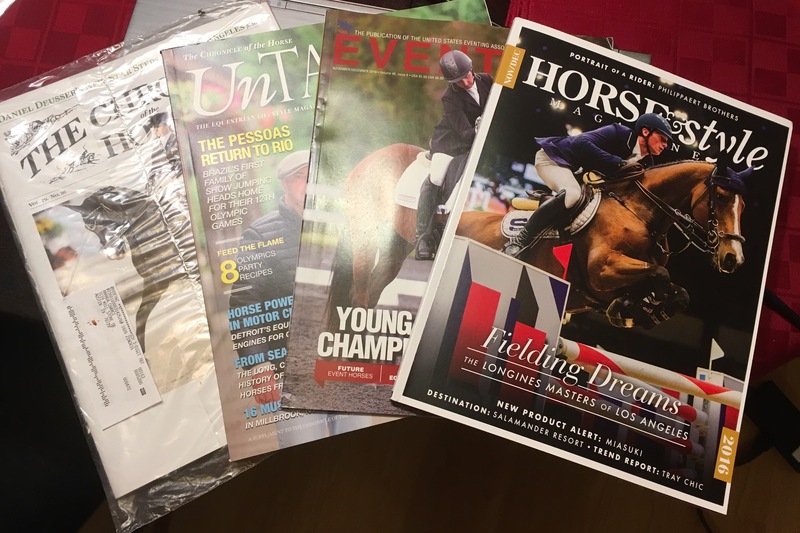 And of course since I’m a USEA member I get their magazine, Eventing USA, which is free with membership or you can buy back issues. It’s actually pretty good. What about you… what are your favorite horse magazines? Next Review: Leistner Premium Collection (and flash sale)! I’ll tell you what is NOT my favorite horse magazine: Practical Horseman. Two years ago, I bought a year’s subscription for like $12 or something, but realized that I really didn’t have a chance to ever read it, so I called to cancel it…or so I thought. I continued to receive “URGENT” notices from PH for months after I had initially called to cancel, and had to speak with a few different reps over the phone to cancel the subscription. At one point, I thought I was finally cancelled and that they would leave me alone….until they sent me a threatening notice in the mail about being ‘delinquent’ in payment (even though I had only paid for one year and had cancelled the subscription after the year was over). I called PH again and spoke with another “manager”, asking them to leave me alone. I kid you not, a few weeks later I received yet another “URGENT” notice in the mail, so I called the BBB and filed a formal complaint against PH. The BBB took action and recorded the formal complaint against PH and sent me a letter stating they had done so, and I haven’t heard from PH since. Calling the BBB seems extreme but I felt like I was being harassed by a company with a crappy magazine that I had only paid $12 for. Moral of this story: don’t subscribe to PH because you will never be able to cancel it. I really like The Horse. I follow them on FB and I agree, they are not afraid to be controversial or blunt, but there is a lot of substance in their content and it is much more international in scope. Totally agree. They’re actually really interesting to follow! None of that bland, PC, cookie cutter crap that so many other magazines spout. I love this post! Thanks for sharing. I’m definitely going to check some of these out! I follow Ride Heels Down on social but haven’t made the leap into their actual issue yet. Horse and Style looks like Vogue for horse people haha. I also like the American “The Horse” magazine – it’s more of a science/research publication with lots of great articles about new studies, horse care, disease, behavior, etc. It’s always educational and I always learn something! PH and COTH lost a lot of their luster for me, as well. I will definitely have to check out these other two! Obsessed with Horse & Style. I also think EQUUS falls into the tried & true category for horse care, horse health, nothing earth shattering but good for people just starting out in horses, like Practical Horseman with a different focus. On the digital front, I read Noelle Floyd a LOT. Equestrian Living and Sidelines Magazine are another two good publications I read every once in a while, but not religiously. You do seem like exactly the target demographic for Horse & Style! It’s pretty great. I love getting Horse & Hound and Horse & Rider when I’m in the UK. The only US magazine I find worth anything is the Icelandic Horse Quarterly. Each article is useful, whether or not you have Icelandics, and well written. I’ll have to check out the horse.. haven’t seen them before thanks!! Totally checking some of those out! The Horse and Style one looks gorgeous. My current subscription is for Horse Sport It’s a Canada centric horse magazine. I buy it for the editorials that aren’t afraid to criticize, but there is a good variety of equestrian sport coverage and training tips in there too. I like young rider and PH. I really, really love Noelle Floyd. Obviously I’m a show-jumper but they record showjumping in such a professional way it is so nice. It feels almost like a sports magazine instead of a horse magazine. There is less ‘hobby horse’ and more serious sport in it. It’s crazy expensive though, so I don’t actually subscribe but rather nab a few issues when they come into work. I’m probably a little biased since I write for them, but I like Sidelines in that it is about the interesting people of all English horse sports–even polo. Its goal is to be like the People magazine of the horse world. I have a fun piece coming up this spring about Jan Ebeling’s teenage son who is training and competing in both the dressage and showjumping world. With Will Simpson as his jumping coach and dad for dressage, I think this kid is destined for something big. Nothing can compare to the photography of Noelle Floyd. I’ve recently picked up both Horse & Style and The Plaid Horse. And one more Equestrian Living. I grew up on Equus, Horse & Rider, Practical Horseman, and Horse Illustrated. And there was one more I loved that for whatever reason stopped publishing: Horseplay.